Thrombin, the key protease of coagulation, is generated by proteolytic cleavage of zymogen prothrombin. Although thrombin production predominantly occurs on platelets and subendothelial vascular walls, extravascular thrombin has been detected in synovial fluid  and around tumors . Thrombin has long been known to activate platelets, and the discovery of PAR1 initiated research into the underlying molecular mechanisms. PAR1 contains a hirudin-like domain, which has a high affinity thrombin binding site and recruits thrombin via exosite I. This interaction enables thrombin to specifically and efficiently activate PAR1 . Similarly, PAR3 contains a hirudin-like thrombin recruitment site, which results in cleavage [9, 21]. In other studies, mouse PAR3 maintained thrombin recruitment activity but lost its receptor function, as discussed above [22–24]. Thrombin also cleaves and activates PAR4, which, in contrast with PAR1, lacks a hirudin-like domain. Thus, higher concentrations of thrombin activate PAR4 and initiate intracellular signaling . PAR2 is considered the only PAR that resists cleavage or activation by thrombin [4, 25], although emerging evidence suggests that at very high concentrations (100–500 nM), thrombin may directly cleave and activate PAR2 [26, 27]. 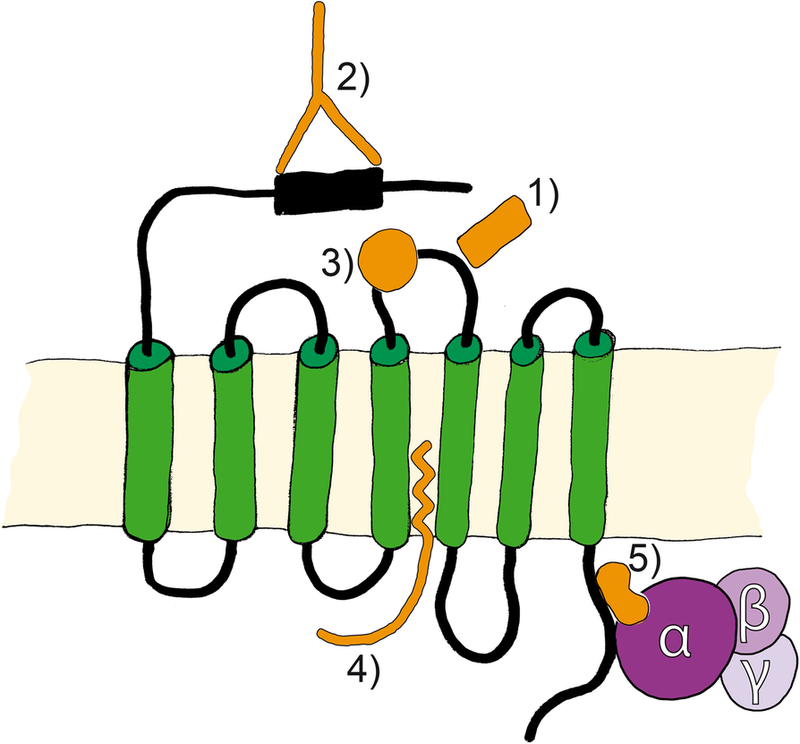 In contrast with thrombin, the anticoagulant protease activated protein C (aPC) binds to the co-receptor endothelial protein C receptor (EPCR) to promote the cleavage and activation of co-localized PAR1 [28, 29] and induce anti-apoptotic and protective effects on endothelial barrier permeability [29–33]. Compartmentalization of PAR1 and co-localization with EPCR in calveolae is crucial for efficient cleavage by aPC . Moreover, aPC cleaves PAR3 in humans and mice [21, 34, 35] and acts as a PAR3 shedding protease that prevents thrombin-induced barrier disruption . However, the dependency of aPC cleavage of PAR3 on EPCR remains controversial [21, 35]. Similar to aPC, coagulation factor Xa binds EPCR and mediates proteolytic activation of PAR1 and PAR3 [21, 28, 36–39]. In addition, EPCR-bound factor Xa reportedly cleaves PAR2 and initiates inflammatory signaling . PAR2 was also shown to be activated by tissue factor (TF)-bound coagulation factor VIIa [40–42]. Yet recent studies suggest that the TF-VIIa complex does not directly activate PAR2, and rather activates matriptase, which cleaves and activates PAR2 [42–44]. Anti-inflammatory signaling was also previously related to PAR1 cleavage by EPCR-bound VIIa [45, 46]. Taken together, these studies indicate that TF-Xa–VIIa complexes activate PAR1 and PAR2 . Tryptase is the main protease of mast cells, and activates PAR2 by proteolytic cleavage to induce calcium signaling and proliferation [54–57]. The source tissue of tryptase reportedly plays an important role in the cleavage and induction of tryptase-activated PAR signaling, reflecting differences in posttranslational modifications, such as glycosylation and sialic acid modifications [54, 58]. Tryptase induces calcium signaling via PAR1 when PAR2 is co-expressed, but cannot activate human platelets, suggesting that tryptase does not directly cleave PAR1 [54–57]. Chymase is a mast cell serine protease that also cleaves PAR1 in human keratinocytes and fibroblasts, and thus prevents thrombin sensitivity . Moreover, the epithelial serine protease matriptase cleaves and initiates inflammatory responses in human and mouse keratinocytes and in Xenopus oocytes overexpressing human PAR2 [44, 60–63]. Matrix metalloproteases (MMPs) are known to be involved in various inflammatory- and cancer-related conditions. MMP-1 cleaves human PAR1 and initiates platelet activation [86–89]. MMP-1 also regulates cancer cell activities depending on PAR1 availability . Similarly, MMP-2 cleaves human PAR1 and enhances platelet activation , and MMP-3, MMP-8, and MMP-9 were shown to induce platelet activation via PAR1 . Whether these three MMPs cleave PAR2 is not clear, although PAR2 activation by trypsin induced secretion of MMP-9 in human airways, suggesting that MMP-9 is a PAR2-activating protease . In mice, PAR1 expression was regulated by MMP-12, and activated PAR1 increased MMP-12 secretion [94, 95]. A similar feedback loop involving MMP-12 and PAR2 has been reported in mice . Moreover, MMP-13 was shown to activate PAR1 and induce intracellular signaling , and thrombin-induced activation of PAR1 and PAR3 was associated with increased levels of MMP-13 in human chondrocytes . Inflammation-associated periodontal diseases are predominantly induced by the Porphyromonas gingivalis cysteine protease gingipain R, which activates PAR2 [107, 108]. Subsequently, gingipain R activates PAR1 and PAR4, and thereby, human platelets [109–111]. This mechanism may also explain associations between periodontitis and cardiovascular events . Similar to proteases from house dust mites, three serine proteases (E1–E3) from cockroach extracts activate PAR2 and induce inflammatory signaling in mice and humans [123–125]. Pen C is a serine protease from Penicillium citrinum that induces IL-8 in human airway cells by activating PAR1 and PAR2 . Proteases from Aspergillus fumigatus have also been shown to prevent PAR2-dependent inflammation . Moreover, serine proteases from Alternaria alternate induced calcium signaling in human bronchial cells and induced inflammation in mice by secreting IL-33 following PAR2 activation [128–130]. Synthetic peptides that mimic the first six amino acids of tethered N-terminal ligands can act as agonist peptides that activate PARs in the absence of cleavage events [11, 18, 134]. Specific activation of PARs by a soluble agonist peptide was first shown for human PAR1 with the peptide SFLLRN [6, 18]. However, this peptide also activated PAR2 [135–137] and therefore various peptides were tested for specific PAR1 activation. Yet, PAR1 was the most specifically and efficiently activated by TFLLRN . In addition to thrombin agonist peptides, other PAR1 agonist peptides have been identified. In particular, the peptide NPNDKYEPF reproduced the effects of aPC , and PRSFFLRN corresponds with the N-terminal peptide generated by MMP-1 . SLIGKV corresponds with the trypsin cleaved N-terminal region of human PAR2. However, the corresponding rat N-terminus SLIGRL is a more specific and efficient PAR2 agonist in rodents and humans [136, 139], and only the synthetic peptide LIGRLO achieved this effect more efficiently than SLIGRL in humans . The roles of ECL-2 in specific PAR activation have been shown using labeled PAR2 agonist peptides [141, 142]. Because the thrombin generated PAR3 peptide does not activate the G protein autonomously, no such agonist peptides have been identified to date [9, 143]. GYPGKF corresponds with the thrombin-cleaved human PAR4 and has weak activity as an agonist . But replacement of the first amino acid glycine (G) with alanine (A) induced PAR4 by 10-fold. This peptide may be suitable as a platelet activator in humans and mice . In addition to activation by heterodimerization, PARs interact with other receptors, such as ion channels, other G protein-coupled receptors (GPCRs), receptor tyrosine kinases (RTKs), receptor serine/threonine kinases (RSTKs), NOD-like receptors, and TLRs . 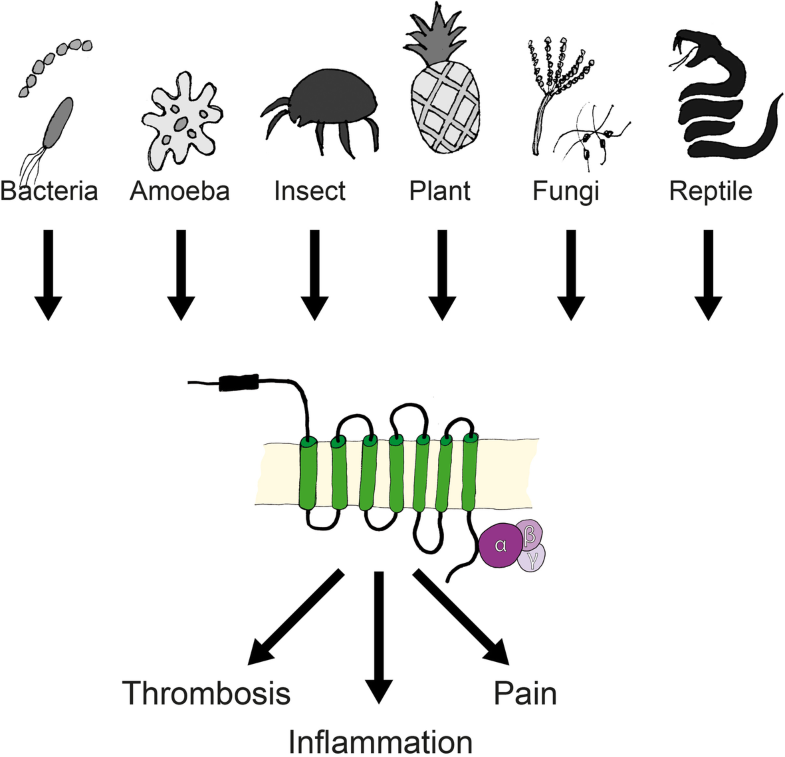 In particular, PAR2 initiated inflammatory signaling pathways, resulting in pain due to transactivation of the ion channels TRPV1 and TRPV4 in humans and mice [155–159]. Similar inflammatory effects follow transactivation of the RTKs EGFR and VEGFR by PAR2 and PAR4 [160–163]. Bacterial interactions with PARs suggest important roles of PARs in infectious disease. In agreement, TLRs recognize bacteria-derived molecules and contribute to innate immunity [164, 165]. Moreover, direct interactions of PAR2 with TLR3 and TLR4 were necessary for inflammatory responses to LPS in human cell lines and knockout mice and rats [166–171]. Following proteolytic cleavage or induction of agonist peptides, the engaged signaling pathways vary between tissues, cell lines, and the availability of co-receptors for transactivation. Depending on the ligand, specific α-subunits are activated, and these regulate subsequent cellular functions as summarized in Fig. 4. For example, thrombin-stimulated PAR1 activates the small GTPase protein RhoA via ERK1/2 kinases, but not via Rac1, whereas aPC-stimulated PAR1 induces Rac1 via Akt kinase, but not via RhoA [13, 174–176]. Moreover, in accordance with PAR1 cleavage sites, aPC prevents thrombin-induced RhoA signaling . However, in contrast with thrombin-induced RhoA activation on platelets and endothelial cells, PAR1-agonist peptides and thrombin activated the inhibitory G protein Gi which leads to the inhibition of adenylyl cyclase in human fibroblasts [177, 178]. Other studies indicate that PAR2 activation is less tissue specific than PAR1 activation, and trypsin and VIIa cleaved PAR2 and activated Gαq and Gi, resulting in calcium influx, MAPK activation, and inflammatory signaling [8, 179]. Signaling by tethered ligands can differ from that generated by corresponding soluble agonist peptides. 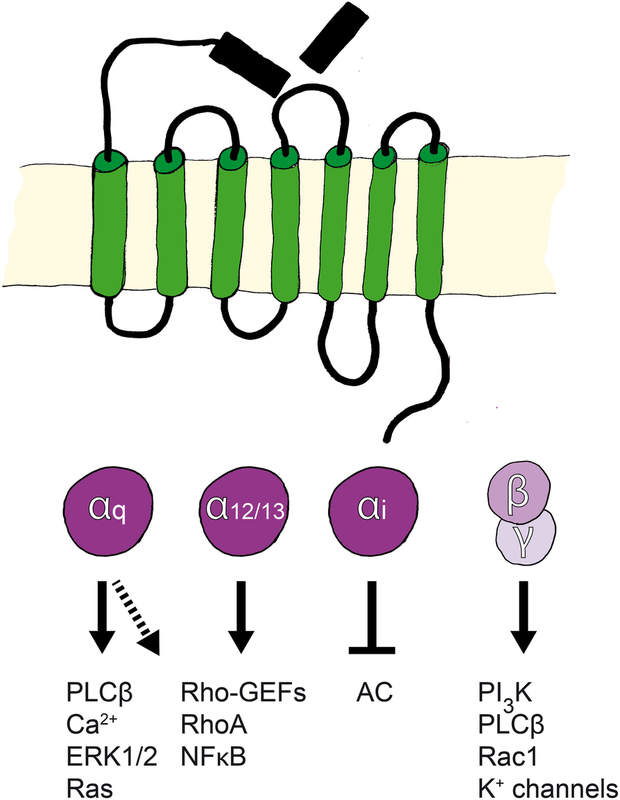 For example, thrombin-cleaved PAR1 activated Gα12/13 and Gαq and induced Rho and Ca2+ signaling, whereas the PAR1-agonist peptide activated only Ga12/13 and downstream RhoA-dependent pathways that affected endothelial barrier permeability . Similar observations of human platelets suggested that platelet activation followed coupling of thrombin-activated PAR1 with multiple heterotrimeric G protein subtypes, including Gα12/13 and Gαq [181–183]. Moreover, trypsin and the PAR2-agonist peptide induced ERK1/2 signaling and inflammation by activating PAR2 [29, 180, 184–186]. β-arrestins also play major roles in PAR-induced signaling independently of G protein activation. For instance, aPC-activated PAR1 induces cytoprotective effects by recruiting β-arrestin in endothelial cells. Thus, aPC cleavage fails to protect β-arrestin deficient cells from the effects of thrombin [187, 188]. In addition, multiple studies show that activated PAR2 co-localizes with β-arrestin-1 and arrestin-2 and induces ERK1/2 signaling [77, 189–191]. Depending upon proteolytic cleavage, PAR1 rapidly internalizes or accumulates on the cell surface [194, 195]. 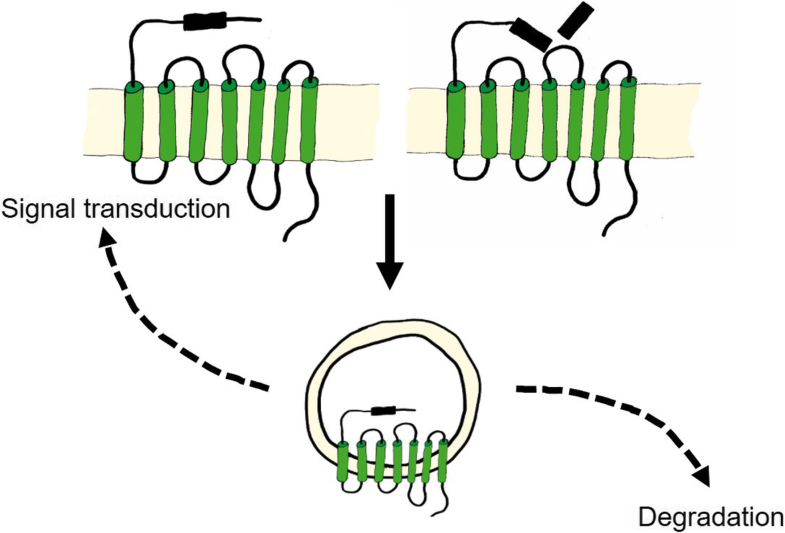 Activated PAR1 is internalized via clathrin- and dynamin-dependent mechanisms, and is sorted from early endosomes to lysosomes for degradation [196–199]. 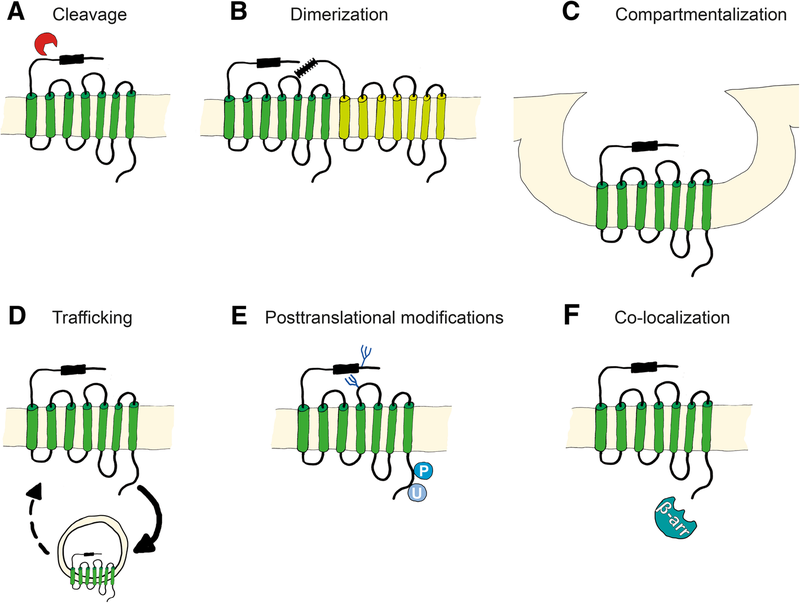 Although the mechanisms that terminate PAR1 signaling are not clearly understood, this process is known to involve phosphorylation, ubiquitination, and recruitment of β-arrestin [200–204]. In contrast with PAR1, activated PAR2 is not constitutively internalized . Thus, to prevent persistent signaling upon activation, PAR2 is phosphorylated and ubiquitinated and then binds β-arrestin before being internalized and degraded [206–208]. Under these conditions, the activated and internalized PAR2 is not recycled and instead induces β-arrestin-dependent endosomal ERK1/2 signaling in the cytoplasm [189, 191, 209]. Thus, large cytoplasmic stores of newly generated PAR2 are required for rapid externalization and activation on cell membranes . Although less is known about how PAR4 signaling is terminated, recent observations suggest that PAR4 internalization is independent of β-arrestin and slowly occurs via clathrin- and dynamin-dependent pathways . In agreement, human platelets internalized PAR4 much slower than PAR1, and exhibited prolonged PAR4 signaling activity . 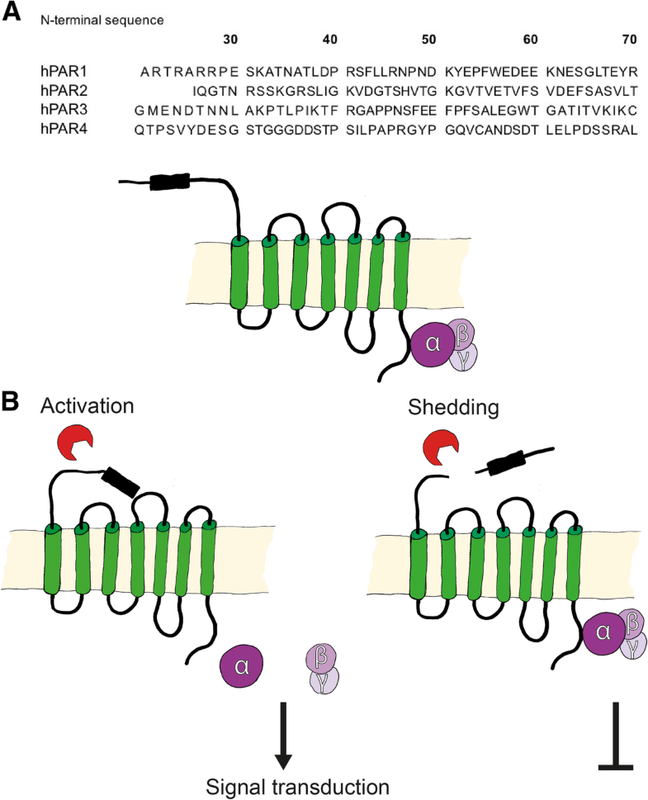 Moreover, growing evidence indicates that PAR–PAR heterodimerization is important for internalization, and that the underlying mechanisms include PAR2-dependent glycosylation of PAR4, thus affecting membrane transport . Upon internalization, endosomal PAR4 dimerizes with the purinergic receptor P2Y12 and induces Akt signaling by recruiting β-arrestin within endosomes . PARs are critical for the interplay between clotting proteases of platelets, endothelial cells, and vascular smooth muscle cells that regulate hemostasis, vascular barrier function, vascular tone, vascular homeostasis, cell adhesion, and inflammatory responses . The roles of PARs in these processes vary significantly between species. Specifically, whereas functional PAR1 and PAR4 are expressed in human platelets , PAR1, PAR3, and PAR4 have been found in guinea pig platelets . Whereas mouse and rat platelets lack PAR1, they are activated at low concentrations of thrombin, which is recruited by PAR3 onto the surface of platelets and then efficiently activates PAR4 . Due to interspecies differences in PAR expression, mouse and rat studies of PARs are difficult to translate to humans. PARs in endothelial cells contribute positive regulatory signals for endothelial adhesion molecules such as vascular cell adhesion molecule-1 (VCAM-1), intercellular adhesion molecule-1 (ICAM-1), and E-selectin [216, 217], all of which promote vascular barrier function. As a counterpart of intravascular cells, PAR4 induces leukocyte migration , and PAR2 expressed on macrophages promotes inflammatory modulators such as interleukin-8 (IL-8) . These modes of signaling all contribute to a complex PAR-mediated interplay of endothelial cells that is orchestrated by intravascular cells and cytokine secretion. In addition, PARs, particularly PAR1, regulate vascular barrier function, and hence, extravasation of macromolecules such as complement proteins and antibodies. In addition, thrombin-mediated activation of PAR1 increases endothelial barrier permeability by activating mitogen-activated protein kinases (MAPKs) . Although this effect is reversed by activated protein C (aPC)-mediated activation of PAR1 [28, 174, 175, 220]. Thrombin further promotes prostaglandin 2 (PGE2) secretion, and consequent endothelial barrier permeability . Similarly, PAR1 activation increased vascular leakage in a murine model . Inflammatory mediators, such as tumor necrosis factor alpha (TNFα), were shown to regulate the expression of endothelial PAR2, and the authors suggested that these data were indicative of barrier protective effects of PAR2 . Several other studies show that PAR2 activation induces endothelium-dependent relaxation in blood vessels of mice and in arteries of rats [224–228]. In contrast, dual activities of PAR2 on blood vessels were reported in a study of rats . In this line, thrombin-activated PAR1 induced the expression of vascular endothelial growth factor in smooth muscle cells , thus revealing the relationship between coagulation and vascular growth. Although the roles of PARs in the development of arteriosclerosis are yet to be elucidated, PAR2 and PAR4 were induced in human arteries under inflammatory conditions , suggesting important roles of PARs in vascular inflammation. In the gut lumen, human and bacterial proteases are both present at high concentrations. Similar to endothelial barriers, proteases regulate intestinal barrier permeability via PARs, all four of which are expressed by cells of the gastrointestinal tract [9, 224, 231, 232]. Trypsins and tryptases are prominent intestinal proteases, suggesting likely involvement of PAR2 as a major receptor of intestinal inflammation. In accordance, intestinal tight junctions are disrupted by PAR2-activating proteases, leading to inflammatory signaling in humans and rats [139, 206, 233, 234]. Although the roles of PARs in irritable bowel syndrome (IBS) and inflammatory bowel diseases remain unclear, roles of PARs in intestinal barrier function have been described. Specifically, PAR1 and PAR2 regulated permeability and chloride secretion, which are involved in diarrhea and constipation in IBS patients [234–236]. In addition, activated endosomal PAR2 caused persistent pain in a mouse model of IBS . It has long been suggested that PARs are involved in the pathophysiology of respiratory disorders, reflecting observations of elevated levels of PAR-activating proteases, such as thrombin and tryptase, in bronchoalveolar lavage fluid from patients with pulmonary inflammation [237, 238]. In a sheep asthma model and in asthmatic patients, tryptase inhibitors reduced inflammation [239, 240], further indicating important roles of PAR2 in respiratory disease. These roles of PARs are also suggested by the prominence of a variety of non-mammalian PAR-activating proteases, such as those of house dust mites and cockroaches [120, 123, 124]. Expression of PAR1, PAR2, and PAR4 on bronchial epithelial and smooth muscle cells induced inflammatory signaling in multiple studies [55, 121, 241–245]. PAR2 is also upregulated in epithelial cells of patients with asthma and chronic obstructive pulmonary syndrome (COPD) [246, 247]. Whether PAR2 activation results in bronchoconstriction or dilatation remains controversial, in part owing to interspecies differences and tissue dependencies [242, 248, 249]. In humans, however, PAR1-agonist peptides with thrombin, and a PAR2-agonist peptide with trypsin and tryptase, induced bronchoconstriction by inducing Ca2+ signaling in airway smooth muscle cells [241, 244]. Moreover, the long-term activation of PAR1 and PAR2 led to pulmonary fibrosis in mice models .